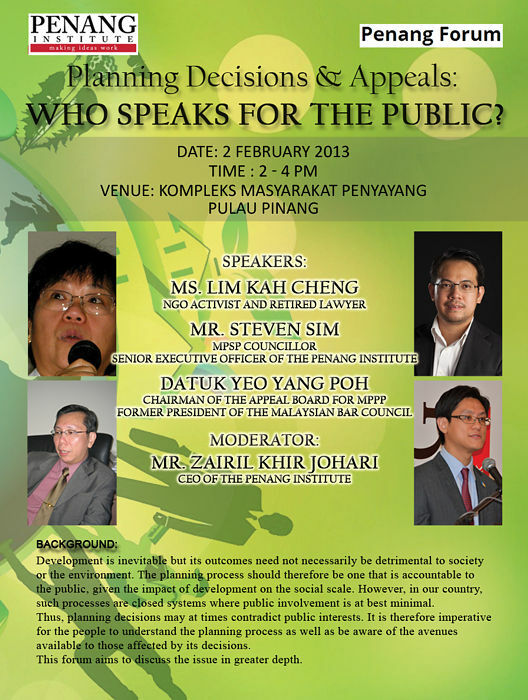 FORUM: Who Speaks for the Public? Development is inevitable but its outcomes need not necessarily be detrimental to society or the environment. The planning process should therefore be one that is accountable to the public, given the impact of development on the social scale. However, in our country, such processes are closed systems where public involvement is at best minimal. Thus, planning decisions may at times contradict public interests. It is therefore imperative for the people to understand the planning process as well as be aware of the avenues available to those affected by its decisions. This forum aims to discuss the issue in greater depth. More info on the Penang Institute’s website.